Discussion in 'Streaming' started by FREEPREMIUM, Sep 14, 2018. FreePremium presents another premium streaming TV account of Hulu. Hulu offers hundreds of thousands of hours of the best television programming and movies to subscribers with limited commercials available monthly. 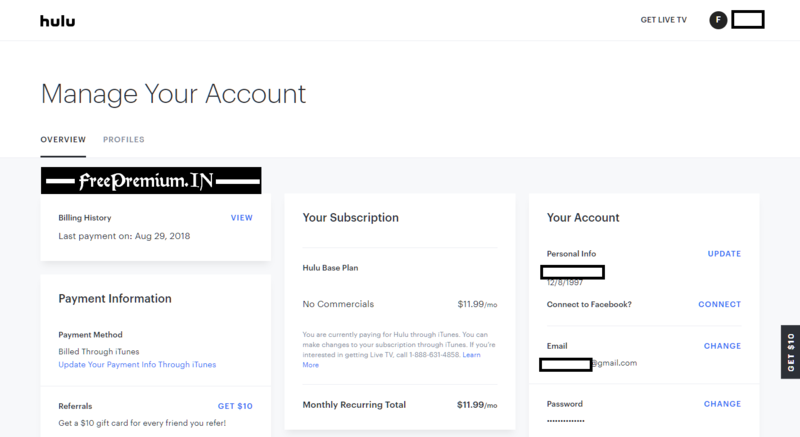 Hulu is a video streaming service: using an Internet connection, it can stream TV shows and movies directly to your device, without the need to purchase them permanently. Getting started with a new service can be a bit tricky. With a Hulu subscription, all you need is an account, a supported device, and an internet connection to start watching your favorite shows. The Hulu subscription service streams the best of TV, full episodes, complete seasons, as well as hit movies, Latino programming, and kid-friendly content. With a Hulu subscription, you gain access to more seasons and more episodes of your favorite shows. One great example is Law and Order: SVU, which has 5 episodes available to free users, while Hulu subscribers can watch over 350 episodes from 17 different seasons. There are also plenty of TV shows that are only available to Hulu subscribers. You can browse through all of the shows and movies available with a Hulu subscription here.A subscription to Hulu also allows you to watch your favorite shows on various supported devices, such as phones, tablets, gaming consoles, Blu-ray players and many more. For more information on supported devices, visit here. One of the quickest ways to find the show you are looking for is to use the search bar at the top of the Hulu.com page or through the search feature on the Hulu app. Type in the name of the show or film that you're looking for and related results will appear. Navigate to the show's name in the search results to visit its main page. From the results screen, you may also Start Watching now or Add to Watchlist for later. Hulu is a premium streaming TV destination that offers hundreds of thousands of hours of the best of the best television programming and movies to subscribers with limited commercials for $7.99 per month or with no commercials for $11.99 per month. Since its launch in 2008, Hecting viewers with the stories they love. Please Don't change the pass. Use yourselves and let others also, other i will put it in surveys. If someone mess with the account let us know, we will update the pass asap. Beastmode, Raul, CaOxide and 25 others like this. Working great bro..thanks a lot! It's working as of 15-09 Great work!